During my 1 month holiday in Cambodia, I wanted to visit one of the community-based tourism projects – somebody in the guesthouse we were staying in recommended the Chambok ecotourism site. So, without much planning or preparation, we decided to just go and see. 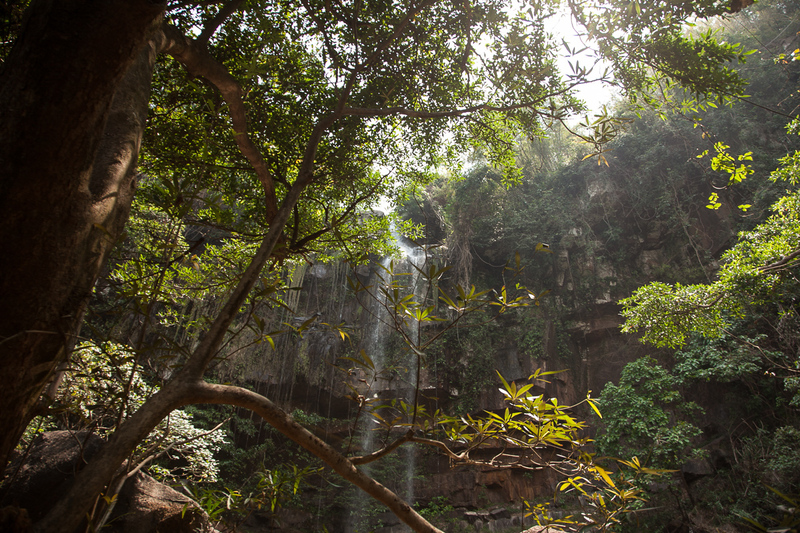 The map said that it was close to Kirirom national park; just 2 hours west of Phnom Penh. A great place to stop if you are heading down to the south coast and island. We just climbed into a local bus, and in two hours we were at the road junction to Chambok. With a little bit of negotiation, (you learn very fast after you arrive in Cambodia), we were on a back of a motorbike heading to Chambok. When we arrived it suddenly dawned on me- we hadn’t called ahead, what if there was no one here? What if there was no accommodation available? As we arrived, all the worry disappeared, nothing was too much bother and soon the ladies were making Khmer curry for lunch that not only smelled amazing but also tasted great. After a lunch of rice and stir-fried beef, we were introduced to our guide. He spoke excellent English. He explained we could stay in a homestay in the village and pay for meals cooked by the family. Perfect! This was what we have been looking for. After being taken to our homestay and meeting the family, we spent the afternoon on a short walk through the forest. Tired, sunburned and hot, we collapsed into bed as soon as it got dark that evening. The next morning, we had arranged with our guide to go on a jungle trek to a waterfall. The trek wasn’t easy but he said this was a daily task for men coming out to get wild food. During the Khmer Rouge years, he said they would come and hide up in these forests and seek refuge to protect themselves. It was fascinating to hear these stories, as so far nobody during our travels really wanted to talk about the war and what happened to this country. His youthful dreams of leaving for Phnom Penh, did not happen… but he said that he was happy living in his community. We stopped for lunch at a waterfall. A tranquil place where we just relaxed, swam and used the opportunity to hide from the sun and the hottest part of the day. To our surprise, our packed lunch was wrapped up in a banana leaf, the most genius environmentally friendly packaging ever! Later that afternoon we stopped at a viewpoint over-looking the national park and soaked up the awesome views. The next day we were ready to leave. I had a great few days here; the effort in going off the beaten path can sometimes really pay off. My only advice is to just go and see for yourself. The community genuinely cares about the environment, incredible when you look at the poverty in the village. But then perhaps this shouldn’t be so astonishing when we consider that developing countries are on the front line of environmental change. This project offers both genuine opportunity to be part of a local community and enjoy the famous “Cambodian hospitality”.